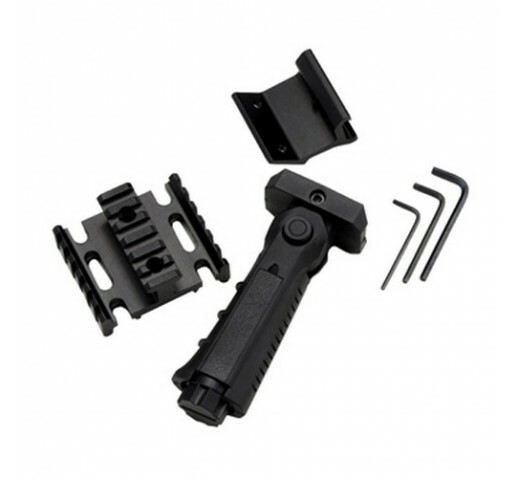 Give your Excalibur Crossbow more of a tactical feel with this forward hand grip package that attaches to your crossbow using the quiver mounting holes and allows you to quickly and easily add any of the multitude of items available for a Weaver 7/8 mount. This kit includes a three rail mounting base plus a reversible quiver mounting bracket and a removable multi-position hand grip that provides a safe and convenient alternative to Excaliburs existing forend grip and will work with any of Excaliburs models except the Vixen. Once the included rail system is installed on your crossbow, almost anything compatible with a Weaver rail can be added!